This framed winter picture was in my August thrifting and rummage sale finds post. This picture is also from a rummage sale. The first upcycle of this picture was simply a chalk painting of the frame with ASCP in Duck Egg Blue. I never really used it myself, and I couldn't sell it, so I decided to re-upcycle it! Both of these pictures have no glass. They are vintage prints on cardboard. Mock oil paintings! I have found that this type of wall art can make great framed wall signs. First, I washed down the winter print with Mr Clean in water and an old rag. It had some Nicotine stains and cigarette smell, so I left it outside for a week under my covered patio to air out. Then I sprayed it with Rust-Oleum ZinsserClear Shellac Spray . Next, I painted back and front, frame and cardboard with two coats of Dutch Boy Chalky Finish Paint in Antiquated Lace. I purchased the paint at our local Menard's store. 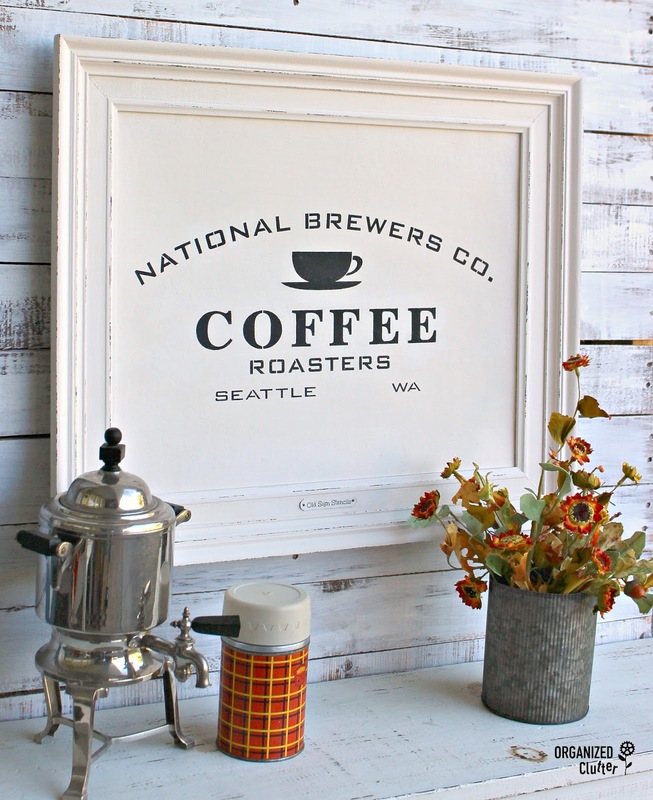 After the two coats of chalk paint, I positioned my *Old Sign Stencils National Coffee Roaster stencil on the center of the framed cardboard. I then stenciled the lettering with my Dreamweaver Brush Set and Ceramcoat Acrylic Paint in Black . I didn't sand the stenciling or the frame, but I lightly distressed the frame with my FolkArt Layering Wood Block and Ceramcoat Acrylic Paint in Walnut . The frame had a gold tone name plate that said Winter Glow. I painted the name plate with chalk paint. I used Picmonkey to make an OLD SIGN STENCILS text graphic. I applied the graphic using the Mod Podge Matte Finish image transfer process. My last step was to seal the piece front and back with Krylon Matte Satin Finish Spray. I love the way it turned out! So easy and inexpensive! 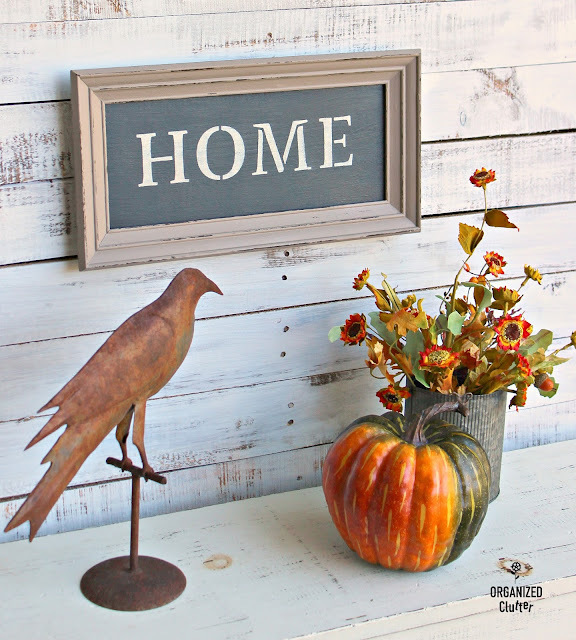 For the other picture, the cardboard was painted with two coats of Annie Sloan Chalk Paint in Graphite, and then stenciled with "Home" from FolkArt Die Cut Paper Stencils Phrases (26-Pack) and Ceramcoat Acrylic Paint in Light Ivory . The frame was re-painted with Fusion Mineral in Algonquin . I used the spray sealer on the this framed sign as well. I"m definitely finding a place for this Home sign! Maybe above a doorway! Love the signs and the way you clearly laid out the sequence to make them. Pinned of course ! That is a great idea for reusing old framed pieces! Yours look wonderful, Carlene! Love the makeovers. I'll think about this next time I see a nice frame and an old picture! I always love your stenciled projects. That coffee stencil is my favorite!! where do you get all your ideas? This is so cute. You are so talented! These pieces add such a nice touch to a home. I love them both, but especially the "Home" sign.